Ki Pro Ultra Plus is a Multi-Channel Apple ProRes recorder offering up to 4- Channels of simultaneous HD recording, or in Single-Channel mode a 4K/UltraHD/2K/HD Apple ProRes® or Avid DNxHD® MXF recorder and player supporting the latest connectivity including 3G-SDI, Fiber and HDMI 2.0, as well as large raster high frame rate workflows, including 4K 60p. Record 1, 2, 3 or 4-Channels of beautiful HD up to 1080p 50/60 in Apple ProRes simultaneously with Ki Pro Ultra Plus. in the studio and when setting up OB trucks. Ki Pro Ultra Plus even allows independent profile support per channel in Multi- Channel mode; select high resolution Apple ProRes HQ for high quality finishing and use a second input to record Apple ProRes (Proxy) for an efficient editing pipeline. Starting with input 1, add channels as needed in order when utilizing like raster size and frame rate, and record your HD Apple ProRes files on the same AJA Pak1000 media. Ki Pro Ultra Plus even allows rollover to a second Pak1000 for hours of uninterrupted multi-channel recording. Ki Pro Ultra Plus includes Ki Protect, a feature that helps to ensure data integrity if a media drive is accidentally removed or loses power during recording. The Ki Protect feature automatically pre-allocates recording space on the media drive for video, audio and timecode when the record button is pressed. While recording, the file header is then continuously updated every time new data is written. That way, the only loss that should be incurred is the last few frames that were in transit to the media drive to be recorded when the operation was interrupted. Frames that are already recorded will be preserved and are recoverable, providing greater peace-of-mind on set and in the studo, essential for multi-channel recording. Full HDMI 2.0 support on Ki Pro Ultra Plus offers deep color support all the way up to 4:4:4 12-bit RGB, perfect for rich color capture from affordable HDMI cameras and beautiful playback on the latest HDMI 2.0 displays. and anyone seeking to utilize the latest affordable capture and monitoring tools. Next generation 4K/UltraHD 50/60p recording and playback are attainable all the way up to Apple ProRes HQ when using AJA Pak1000 SSD media with Ki Pro Ultra Plus. 4K/UltraHD is supported through 4x 3G-SDI, HDMI 2.0 or optional Fiber inputs and outputs. Ki Pro Ultra Plus not only supports true 4K at 4096 x 2160p for digital cinema and high quality UltraHD for broadcast production, it also offers the color depth to match. Any shoot or project benefits from the fabulously rich colors and smooth gradations across the luminance and chroma range that 12-bit makes possible with full 4:4:4 support including Apple ProRes 4444 XQ. it all from 4:2:2 YCbCr to full 4:4:4 RG in 12-bit. of Apple ProRes® including Apple ProRes 4444 XQ. This lets you choose the balance of image fidelity and file size that's right for each individual production as well as having the flexibility to record directly to native file formats that are understood by most major editing systems. 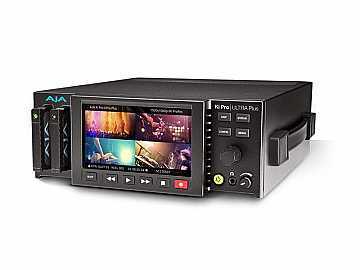 Ki Pro Ultra Plus offers native Avid MXF support for HD workflows. Record and playback DNxHD files with an OP1a profile within an MXF container for DNxHD HQX (220x), DNxHD SQ (145) and DNxHD LB (36) codecs. This provides a native MXF workflow for Avid pipelines, free of transcoding. Ki Pro Ultra Plus supports both Square Division Quad Split format and Two Sample Interleave giving a wide number of options to both record and playback 4K and UltraHD. Ki Pro Ultra Plus provides full 16-Channel audio support embedded over SDI or Fiber. Flexible routing options mean that 8-Channel only outputs like HDMI, Analog and Digital carry options for selecting the 8-Channel group required. Monitoring via the headphone jack on the front of the unit is split into easy 2-Channel groupings for on-set checks. If you need to record or playout video with Closed Captioning embedded, Ki Pro Ultra Plus is fully compatible with your needs. Ki Pro Ultra Plus recognizes CEA-708 within incoming SDI Inputs and encodes the Closed Captioning to your Apple ProRes recorded file. Upon playback, you can utilize the Closed Captioning within a recorded file over Ki Pro Ultra Plus' 4 x 3G-SDI outputs. Ki Pro Ultra Plus captures directly to rugged and reliable AJA Pak SSD media. Pak media is available in a variety of capacities to best suit the demands of your production. Pak1000 is the perfect companion for Ki Pro Ultra Plus offering 1TB of fast SSD media for up to 4K recording at 60p in ProRes HQ and is required for Multi-Channel HD capture. Pak512 and Pak256 media is ideal for lower frame rate projects. Ki Pro Ultra Plus features a beautiful high resolution HD display for pristine monitoring of your material, and serves as your interface to Ki Pro's familiar and intuitive menu system. The detailed overlay UI includes onscreen keyboard functionality and a clear view of the powerful yet simple to operate UI, all pristinely presented on the 4.8” 720p LCD display. The large LCD provides detailed playback and monitoring perfect for onset use, the O.B truck, helicopter or studio and it’s transparent menu overlays can be set at just the level the user prefers. Ki Pro Ultra Plus offers control over brightness of the display for flexible control to suit your working environment. Just like a traditional tape deck, Ki Pro Ultra Plus features straightforward and dedicated transport buttons - record, play, stop, rewind, fast forward - making the device easy to operate with minimal training time. The current status of the system and key configuration information is clearly displayed on the beautiful built-in high resolution LCD screen. Additional operational information can be found in the STATUS menu which can be accessed even when recording or playing back. Ki Pro Ultra Plus provides full resolution outputs for 4K, UltraHD and HD over 3G-SDI, FIber and HDMI, including the latest affordable UltraHD monitors using HDMI for on-set quality checks. An additional dedicated 2K and HD-SDI monitor output can be fed to any affordable and existing HD-SDI display.